January is National Soup Month! 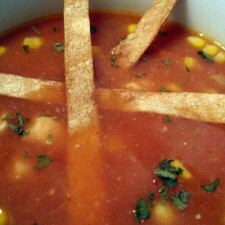 So I decided to try out this recipe for chicken tortilla soup. It is pretty inexpensive to make and it is not a thick, creamy soup that will leave you feeling full for hours. It definitely cured my craving for hot soup on a cold, winters night. Yes, it actually got cold here in Florida (well in the 40’s at night). Coat a 6-quart saucepot with coconut oil. Heat over medium-high heat for 1 minute. Add the chicken to the saucepot. Cook until it’s browned, stirring often. Stir the broth, cumin and rice in the saucepot. Heat to a boil. Reduce the heat to low. Cover and cook for 20 minutes. Stir the corn, salsa, cilantro and lime juice in the saucepot. Cook until the rice is tender. 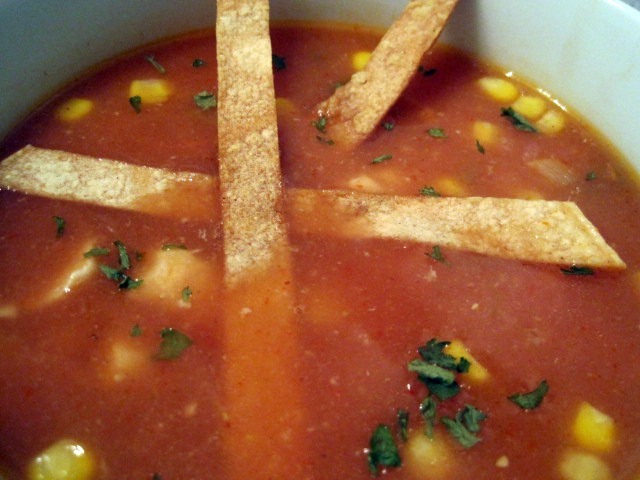 Top each serving of soup with Crisp Tortilla Strips. Heat the oven to 425°F. Cut 4 corn tortillas into thin strips and place them on a baking sheet. Brush with Kelapo coconut oil. Bake for 10 minutes or until golden.